I’ve written plenty of times about our Silvaner being a fragile fellow. It’s the most interesting and important variety we have. And it’s fading away relatively quickly when exposed to air in a glass. I’ve tested it several times. Some test glasses lastet four hours till the Sherry nose kicked in. Some only one. So time to think about adding sulfites for bottling. But how much? And why not adding it earlier? Let me quickly wrap up which job SO2 – or sulphur dioxide – has in the winemaking process. Generally speaking there are two. Firstly SO2 acts as an agent to inhibit enzymatic and non-enzymatic oxidation. Secondly it inhibits the growth of microorganisms: bacteria, molds and yeasts. You can imagine that it is used widely in the food industry. Of course the impact doesn’t end with these preservation effects. The SO2 can react with all kinds of components a wine consists of: acetaldehyde, sugars, leto acids, amino acids, proteins, phenolic compounds, pigments, … nobody will argue that it doesn’t change the wine to be a different beverage that it was before. Mostly sulfites are added in the form of liquid SO2 coming out of a cylinder. And this is often done several times in the process of conventional winemaking. Right after picking the grapes to avoid oxidation and wild yeast action, right after crushing to prevent wild yeasts to kick off fermentation before “cultured” yeast has been added. 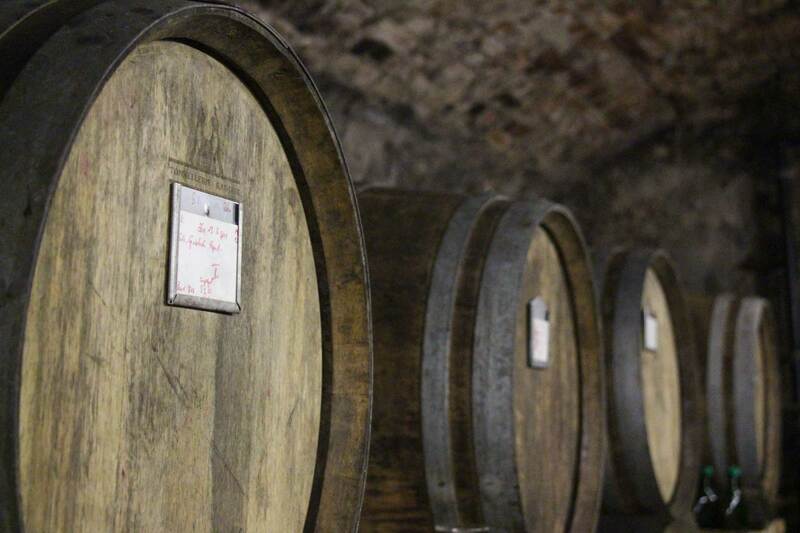 Almost always at the end of (white wine) fermentation to avoid malolactic fermentation to start. When the wine gets bottled to avoid a second fermentation when the wine contains residual sugar and to prevent oxidation in the bottled wine. Oh and of course every time the winemaker is concerned. And because of all these reasons the winemaking mainstream believes it is (almost) impossible to make wine without any SO2 additions. What is wrong. If you pick healthy grapes in the morning and don’t let them wait in the sun for half a day nothing bad will happen, no SO2 needed. If you don’t like to use cultured yeasts (which make all wines taste very similar) you’ll embrace the wild yeasts so no need to add any SO2 at this stage. If you work well in a clean cellar and don’t bother the wine doing its malolactic fermentation there is no need to add sulfites at this point. The only stage where it actually might be necessary is bottling white wine. While red wine has enough anti-oxidants from its skins white wine can be unstable. 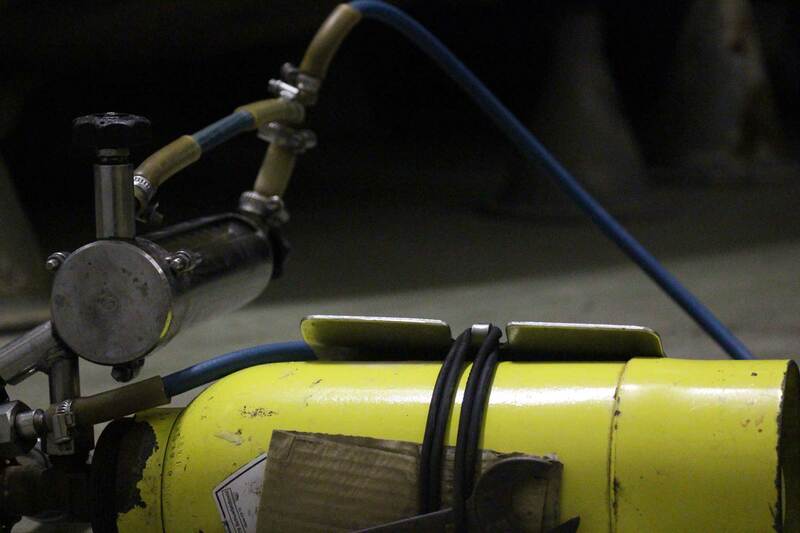 I did a few experiments last week to learn more about the impact of SO2 on our Silvaner. It’s fascinating if you see it happening the first time. I filled four glasses. One with 20 mg/l and one with 10 mg/l SO2, one with tannin powder (just out of interest) and one glass raw Silvaner. The first thing I noticed was that I could taste the SO2 clearly and I did’t like it at all. You can taste sulfites in wine from 20-30 mg/l I read but even the 10 mg/l were clearly recognizable. I have to confess: the addition of tannin made it an interesting beverage. So I will extend must fermentation significantly this fall (but of course not add any powder to the wine!). 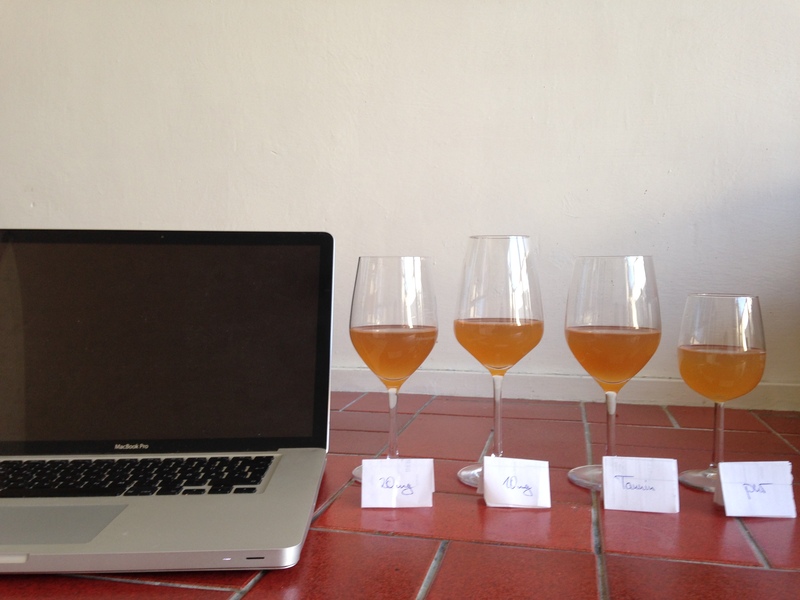 The Silvaner without additives started to turn from a bright orange to a full and deep orange until it started turning brownish after four hours. The taste became fuller and the oxidation was releasing pleasant new aromas until it got a strong Sherry aroma and became really weird. The extra tannin version lastet two hours longer and the other glasses another four hours. So next step: adding as little as 5 mg/l to a test bottle and see where it hours till the beginning of May. It doesn’t influence the taste so that I can still recognize it and hopefully adds a little extra stability. So my point is: a small dosage of SO2 will extend the life of a wine but also keep it alive. And “a small dosage” means up to 25 mg/l I’d say. And not before bottling. I just organized a little tasting where a consultant suggested adding 5 mg/l now to take care of the acetyldehydes. But hey. The wine is safe in its barrel and as a natural winemaker I don’t ask “why do I do NOT add something?” but “why DO I need to add something?”. Update: there are a couple of interesting comments on reddit.